The Enactus UBC Okanagan team competing at the national exposition included, from left, Kim Duong, Erkki Annala, Nicole Michalewicz, Ishita Ashraf, Tristan Ramsay and Puru Pradhan. (Missing from photo: Milan Hecimovic, Ashish Meghani, Mohammad Al Jamal, and Phoebe Kotulska). Held in Vancouver, the national exposition allowed all Enactus teams in Canada the opportunity to showcase their efforts throughout the year and to compete against one another in business presentations. 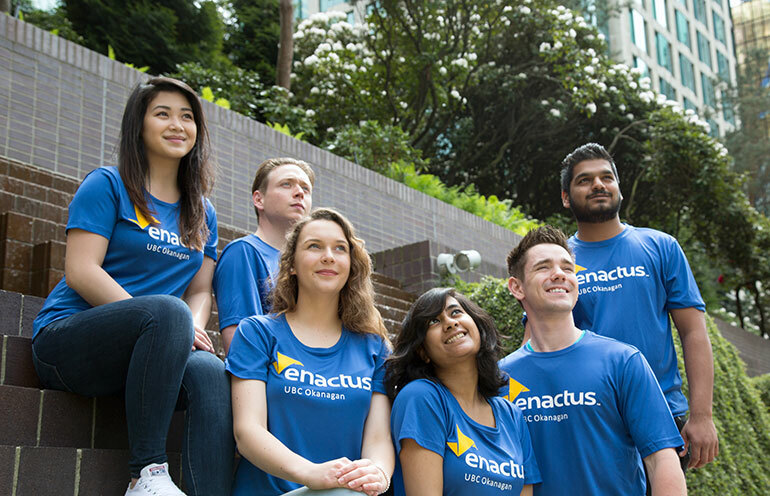 Joining a community of Enactus groups at many other Canadian universities and colleges, the Enactus UBC Okanagan team involves student, academic and business leaders using entrepreneurial action to create a better, more sustainable world. A truly interdisciplinary group, the team includes students pursuing degrees in nursing, human kinetics, management, civil and mechanical engineering, economics, philosophy and political science. Inventathon, a semi-annual 24-hour case competition allowing students the ability to learn new skills and take their ideas further, launched in February with the next Inventathon taking place in the fall 2017 term. Project Roots, soft-launched in April with a full-scale roll out planned for September 2017. An ambitious project designed to address the concern of food security, Roots is a social enterprise that will allow students on campus to access fresh and nutritious produce at prices 40 to 60 per cent below retail prices while supporting local farmers. The team won the Hellman's Best Project Solution award for their food security project proposal and received the Enactus National Competition Opening Round Runner-Up Award and the National Rookie Champion award as the best new team in Canada. A third project -- not presented at the exposition -- is Project FLOW, which involves a smart sensor suite being designed to allow for maximizing irrigation efforts for all farms, big and small. “At the time of the competition, the team was officially only three months old,” said Enactus UBC Okanagan president and co-founder Erkki Annala, who just completed his first year in the Bachelor of Science in Nursing program.